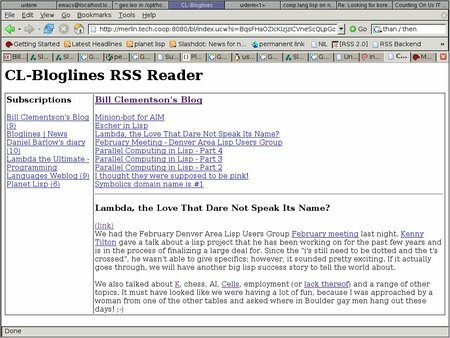 Two people so far have taken Peter Siebel up on his challenge of creating an RSS reader that can compete with a 150-line Groovy implementation. Drewc used a secret GUI weapon I had forgotten about when I said that the only way someone would be able to compete with the Groovy app was to integrate with Java or Cocoa, or use CLIM: He created a webapp and generated HTML. It took me about 3 hours to write. The initial quick hack version took only about an hour and was about 120 lines, but it was not as nice as this one :). The final version of the code, at about 200 lines, looks pretty good and wouldn't be hard to turn into a desktop GUI app. 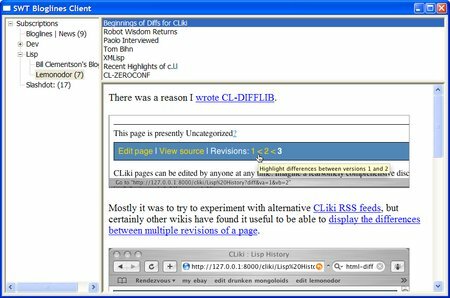 Rich Hickey used some serious Java integration, in the form of his not-yet-released successor to JFLI, Foil. His code uses SWT and attempts to mirror the structure of the Groovy version. The code length is about the same. I don't see any wins for Groovy here.